With the announcement earlier this week that Apple is likely to debut the next generation iPhone next week, many current iPhone owners are wondering what to do with their old phones when they upgrade, and if they’re worth anything. Users of an iPhone 4, 4S or 5 can take advantage of a price lock-in program currently being offered by Gazelle, a company that specializes in smartphone buyback programs. Gazelle will allow users who choose to trade in their phone to hold onto it until October 15th – giving them more than enough time to purchase the next model of the iPhone when it comes out later this month. As an example of buy-back prices, Gazelle will purchase a used iPhone 5, 16 GB, on AT&T’s service for $305. 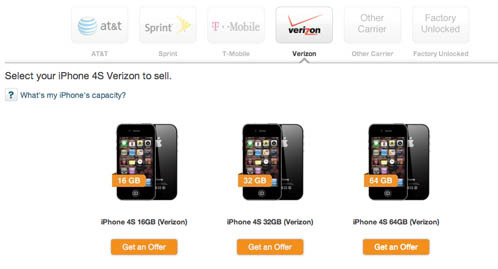 An iPhone 4S, 32 GB, on Verizon’s network will fetch $155. Both offers assume that the used phone is in good condition, and shows only normal signs of wear. Once Apple announces the next version of the iPhone, rumored to be the iPhone 5S, it is likely that prices for older units will drop significantly. In addition to the announcement of the iPhone 5S next week, it is also rumored that Apple will bring a lower-priced entry level iPhone model to market – thought to be called the iPhone 5C. The 5C will feature a plastic housing, and is said to come in a variety of pastel colors. Apple will make its iPhone 5S announcement on September 10 at 10:00 AM Pacific Time.